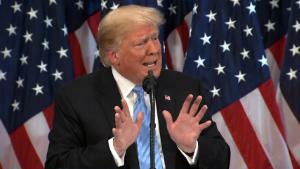 Washington – President Donald Trump praised his Supreme Court pick Brett Kavanaugh on Saturday night, tying a vote for the nominee to combating the Democratic party’s tactics. “A vote for Judge Kavanaugh is a vote to reject the ruthless and outrageous tactics of the Democratic Party,” Trump said at a rally in Wheeling, West Virginia. Trump said that Kavanaugh has “suffered the meanness, the anger” of the Democratic Party throughout his nomination process. Kavanaugh testified before Congress on Thursday, forcefully and emotionally denying an allegation from Christine Blasey Ford that he sexually assaulted her decades ago when they were teenagers. Ford also testified at the hearing about her allegation. The President said on Saturday that the “American people saw the brilliant and quality and courage” of Kavanaugh that day. “A vote to confirm Judge Kavanaugh is a vote to confirm one of the most accomplished legal minds of our time, a jurist with a sterling record of public service,” he told the crowd of West Virginia supporters. The President obliquely referred to Kavanaugh’s nomination while talking about the importance of Republican turnout in the midterm elections. The first key procedural vote on the Senate floor on Kavanaugh’s nomination is expected to take place no later than Friday, a senior GOP leadership aide has told CNN.